In November of 2001 Boise Steel Erectors, Inc. became the Nation’s first subcontractor to partner with OSHA. To this day Boise Steel remains committed to staying current with our OSHA Partnership. BSE’s employee modification rate (EMR) has been as low as .72. and has a goal of achieving a .66. Boise Steel Erectors would rather send a good employee home for not following established safety procedures, than send an employee home or to the doctor’s office with injuries sustained from a construction accident that could have been prevented. As such, we would encourage all companies to invest in the cost associated with extra equipment, materials and man-hours to maintain a safe work place. At Boise Steel Erectors, you’ll find fairness and straight talk along with the financial resources and manpower to accommodate your needs. Integrity and stability are the hallmarks of our company. Each project is viewed with the long-term relationship in mind. We take pride in our past accomplishments and the reputation we’ve built by consistently producing excellent results and satisfied customers. We average 65K man hours per year. Each construction project has unique challenges that require experience, versatility and a dedicated management team to successfully complete the project. 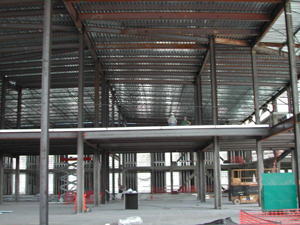 At Boise Steel Erectors every project is handled with consistent emphasis on safety and unparalleled quality. No job is finished until the client is completely satisfied. Boise Steel Erectors has always been committed to providing a safe and healthy work environment for all personnel. BSE has in-house certified trainer allowing for all employees to have their OSHA 10 or 30 hour cards. Employees are also trained in-house on Rigging, Fall Protection, Forklift, and Signaling. BSE has trained and or certified 17 welder in all types of welding procedures. Safety is an integral part of our operation at Boise Steel Erectors. Our company is committed to the goal of zero accidents on all projects. No work is so important that it cannot be done safely.